Sarah and I were out of bed very early this morning to make our way to Washington, DC. Our first stop was at Jenny's house were we met up with Derek, Crissy and Jake. Sarah and I rode in my Celica. While the other four rode together in Mom's SUV. We rolled out from Jenny's at 3:20am. We all made a quick stop at a Burger King in Maryland and arrived at the Holiday Inn in Alexandria, Virginia around ten o'clock. We checked into the hotel and headed for the Metro to begin our sightseeing for the day. That's when the fun began. Jenny, Sarah and I went together to purchase our Metro passes for the day and the machine failed to print two of the three passes. It took nearly an hour with two station managers and a technician to get the problem resolved. In the end Jenny had talked the station manager into giving all six of us passes for all three days of our visit. 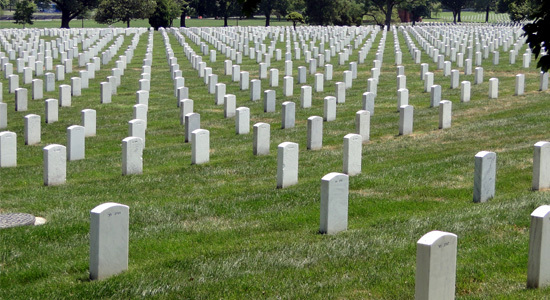 Click here to see pictures of Arlington National Cemetery. Click here to see the pictures of the John F. Kennedy Gravesite. The grave of President Kennedy is marked with an eternal flame and is also the resting place for his daughter, son Patrick and his wife Jacqueline Kennedy Onassis. The gravesite is surrounded by the words of his inaugural address carved in granite. Click here to see my pictures for the Tomb of the Unknowns. We walked further across the cemetery to the Tomb of the Unknowns. We were able to see the changing of the guard twice and a wreath laying ceremony. 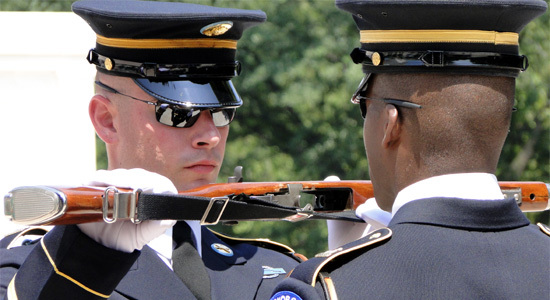 The precision of the honor guard was awe-inspiring. It truly is hollowed ground. We then made the long walk from out of the cemetery and back to the Metro station where we rode another two trains to Union Station. 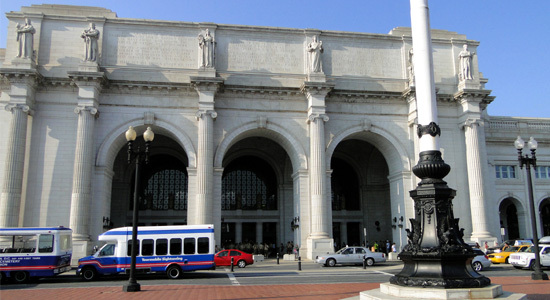 Click here to see pictures of Union Station. We stopped and had burgers at Johnny Rockets in Union Station. I had the Smoke House Cheeseburger. Yummy. It was the first time any of us had ever eaten at Johnny Rockets. After dinner Jake wanted to watch the trains entering and leaving the station. I took the opportunity to go to the top of the parking garage and get some pictures of the U.S. Capital Building. The capital and the nearby Supreme Court Building and the Library of Congress were also our next destinations. 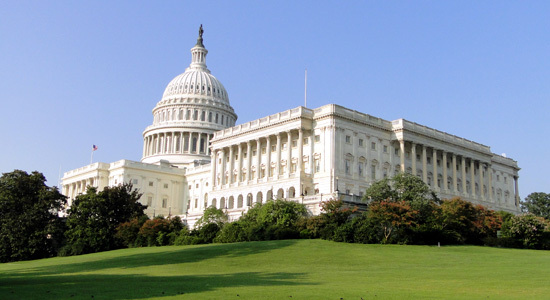 Click here to see my photos of the U.S. Capital Building. Click here to see pictures of the Supreme Court. Click here to view the pictures of the Library of Congress. These important buildings were each beautiful with their detailed architecture, huge scale, landscaping and fountains. We were already getting tired, but there was still a long walk ahead of us across the Mall to the Washington Monument and the World War II Memorial. Click here to see all my pictures of the Washington Monument. Click here to see my photos of the World War II Memorial. The sun was getting lower in the sky as we walked around the Washington Monument. It still amazes me how tall it really is. 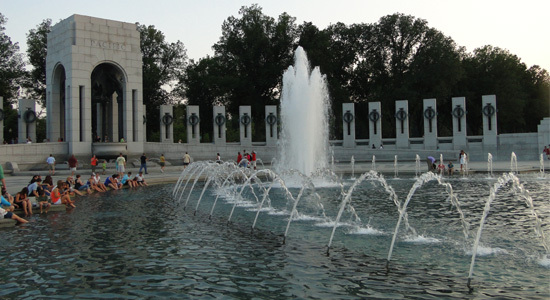 The World War II Memorial is one of the new sites that have been added to the city since I was first here back in 1982. This open memorial with its numerous fountains and large pool blends in perfectly with the reflecting pool next to it. It was another long walk to the Lincoln Memorial at the far end of the reflecting pool. 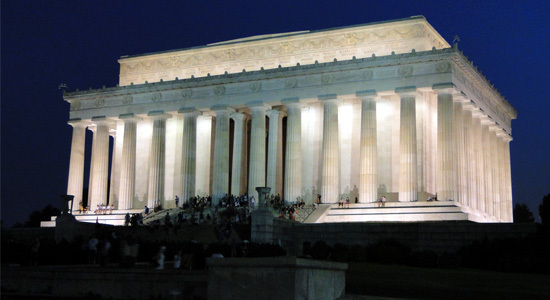 Click here to see my pictures of the Lincoln Memorial. We were able to get some great pictures of the Lincoln Memorial at dusk. The bad thing about ending our day at the Lincoln Memorial is that there are no Metro stations nearby. We had to walk across the very long Arlington Memorial Bridge to reach the station at Arlington National Cemetery. We then rode two more trains before finally returning to our hotel. After all the long walking in the near one hundred degree heat we were all completely exhausted. I was the hottest, smelliest, sweatiest and nastiest I have ever been. After we all got our much-deserved showers and tended to our sore feet, legs and backs, we had pizza delivered to our rooms.